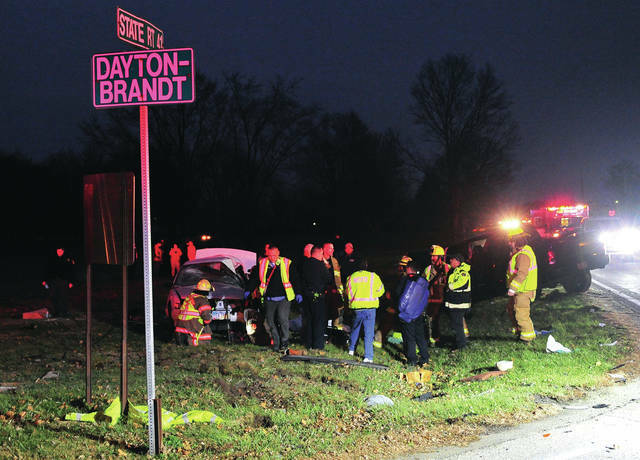 Mike Ullery | Troy Daily News First responders from Elizabeth Township, Christiansburg, New Carlisle and the Miami County Sheriff’s Office work at the scene of a two-vehicle fatal crash on State Route 41 at Dayton-Brandt Road on Wednesday evening. ELIZABETH TOWNSHIP — A two-vehicle crash at State Route 41 and Dayton-Brandt Road resulted in one fatality late Wednesday afternoon. First responders were dispatched to the crash scene around 5:15 p.m. The 911 caller indicated that one person might not be breathing. Elizabeth Township medics, along with Christiansburg Fire Department, and New Carlisle Fire responded to the scene where CPR was begun by bystanders and continued by paramedics, but they were unable to revive the victim who was pronounced dead at the scene. A mutual aide medic from Troy was dispatched as well. The lone occupant of the second vehicle refused treatment at the scene. According to Lt. Todd Tennant of the Miami County Sheriff’s Office, the driver of a pickup truck was westbound on State Route 41 when a white sedan that was northbound on Dayton-Brandt Road apparently failed to stop at the stop sign and was struck by the pickup. Both vehicles sustained heavy damage and ended up in a nearby field. The sedan’s driver died at the scene and the victim’s name has not yet been released. A crash reconstruction team from the sheriff’s office was called to the scene. State Route 41 was closed for several hours. https://www.dailycall.com/wp-content/uploads/sites/30/2018/11/web1_112118mju_crash_sr41_fatal-1.jpgMike Ullery | Troy Daily News First responders from Elizabeth Township, Christiansburg, New Carlisle and the Miami County Sheriff’s Office work at the scene of a two-vehicle fatal crash on State Route 41 at Dayton-Brandt Road on Wednesday evening.